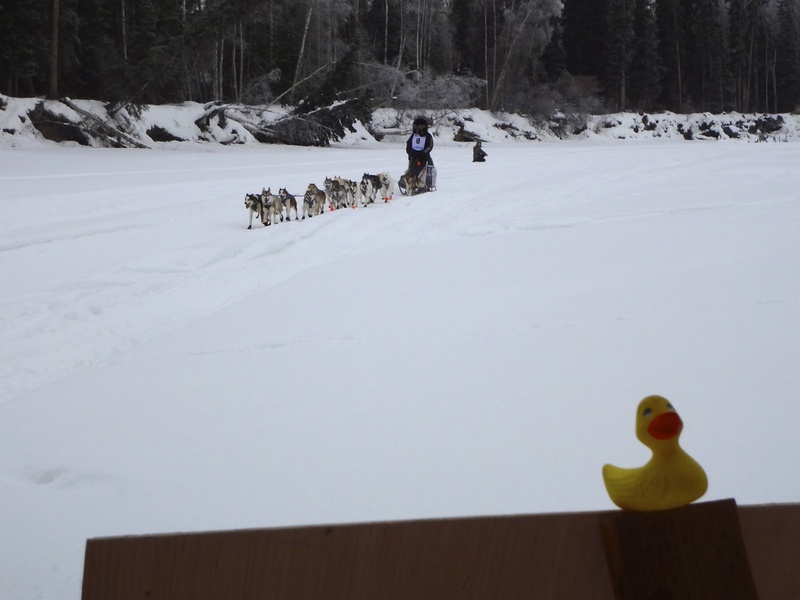 Eider Duck, our Alaska cousin, brought us some photos from the starting point of the Iditarod in Fairbanks. 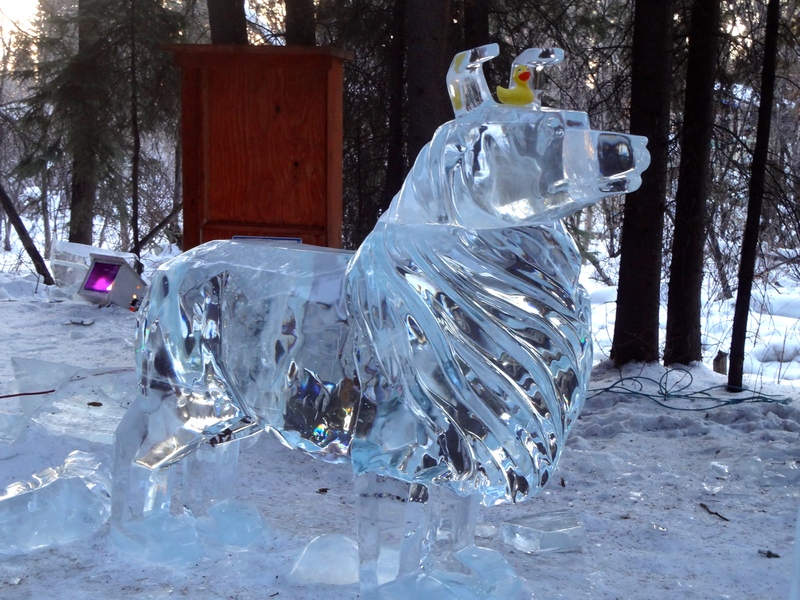 The Iditarod is a dog sled race in Alaska. 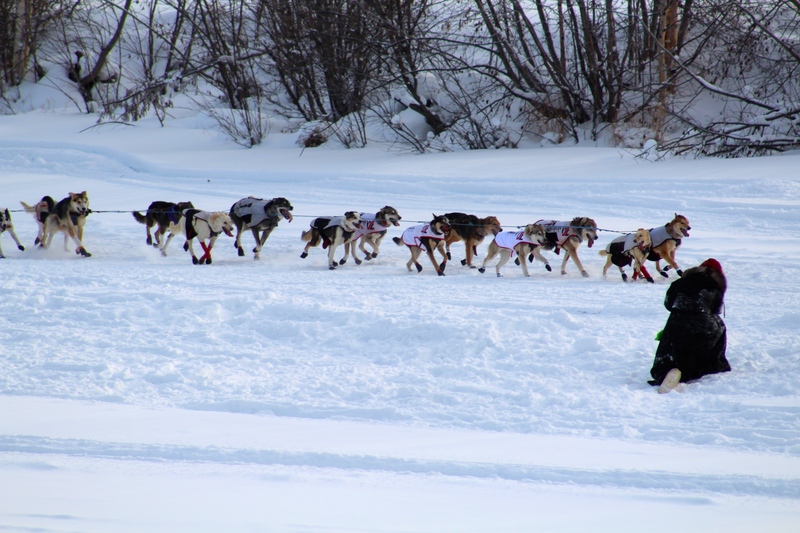 Some call the Iditarod the “last great race.” The race usually begins in Anchorage, Alaska and ends in Nome, Alaska. 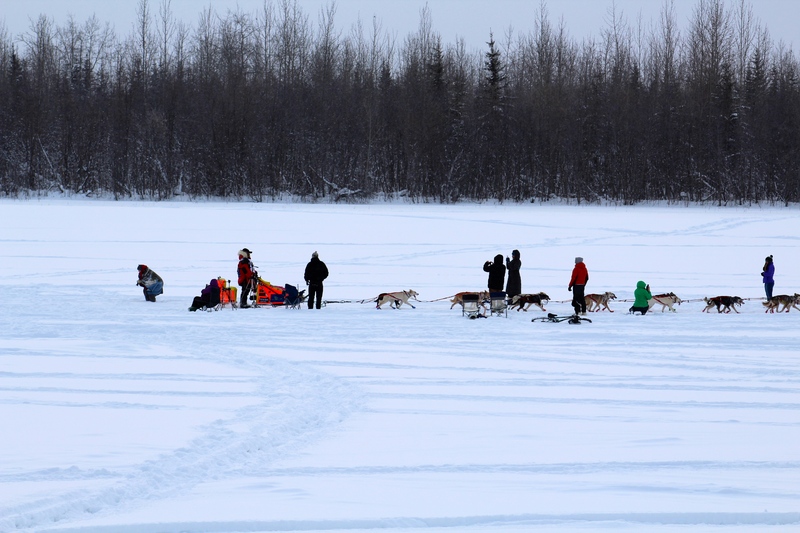 This year, however, there was not enough snow in Anchorage for the beginning of the race. 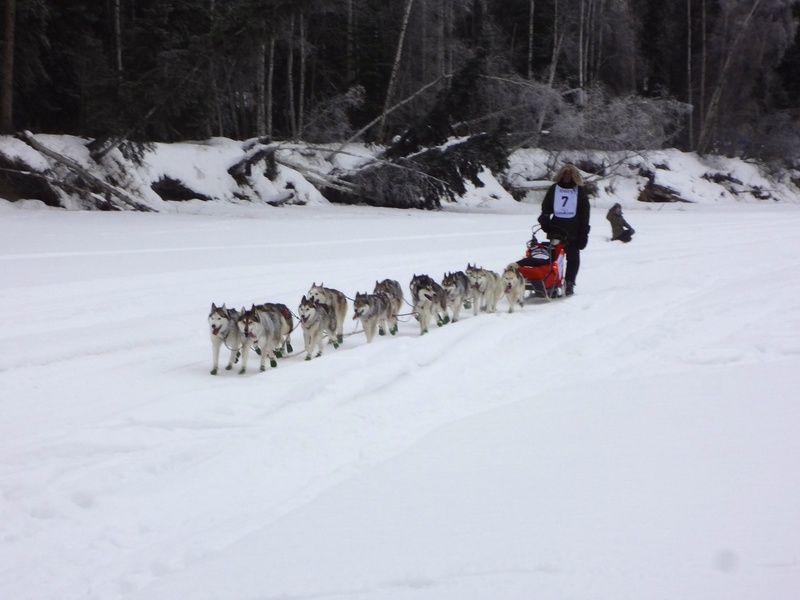 The race was Re Started Monday, March 9, 2015 at 10:00 a.m. in Fairbanks, Alaska. 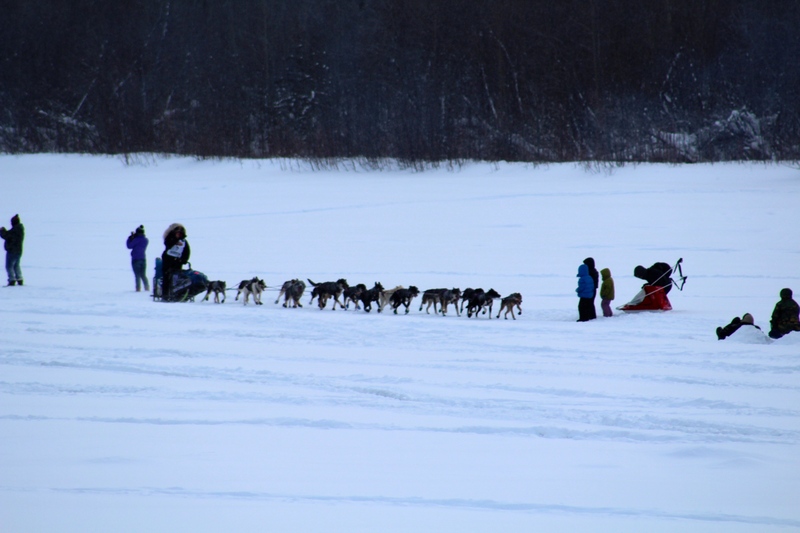 The awards banquet is scheduled for Sunday, March 22 at 4:00 p.m. in Nome, Alaska. These are some of the photos Eider shared with us. 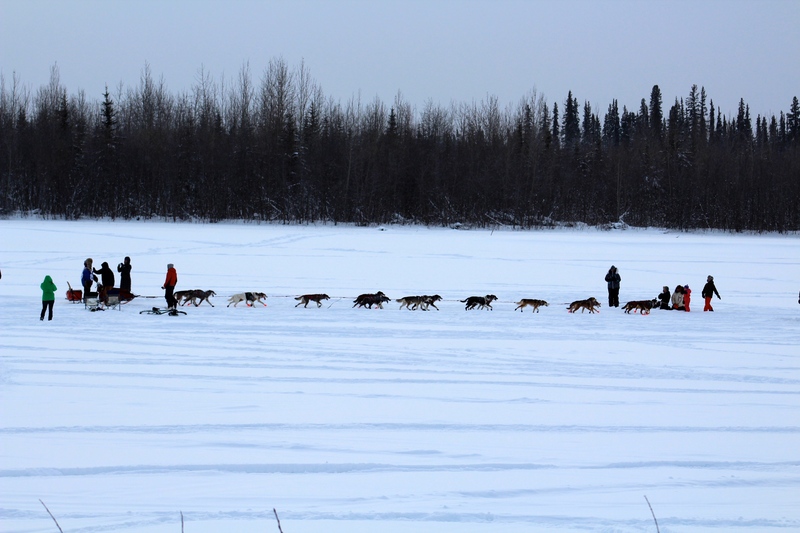 These photos were taken from a distance, so we are not sure whom the mushers are, but we love these. Thanks Eider! 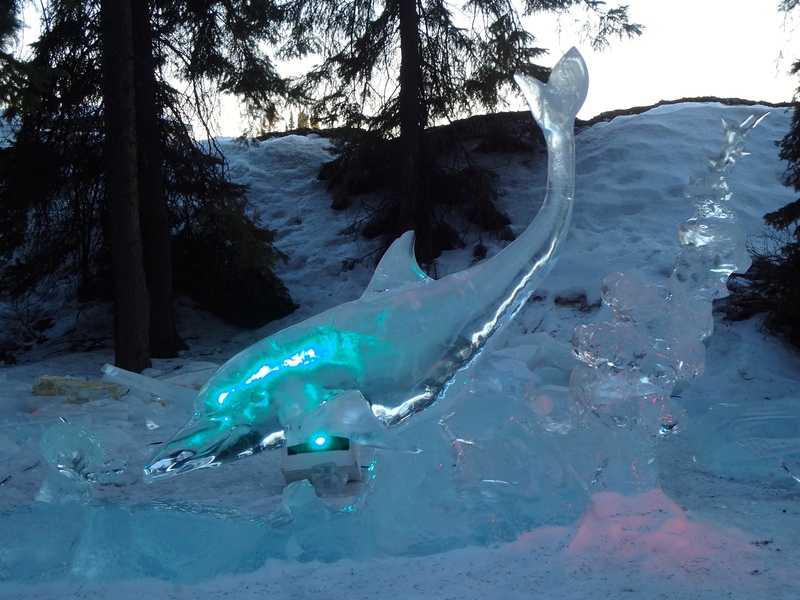 Last time we showed you some snow sculptures from Breckenridge, Colorado. 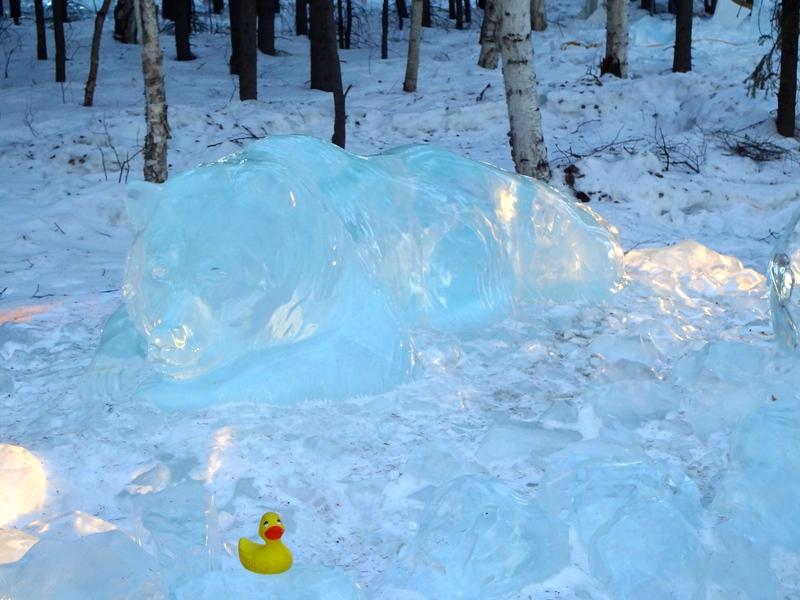 My Alaska cousin, Eider Duck, sent us some photos of ice sculptures from the ice park in Fairbanks, Alaska. We think these pictures are really great. Hope he is not mad. He is big! 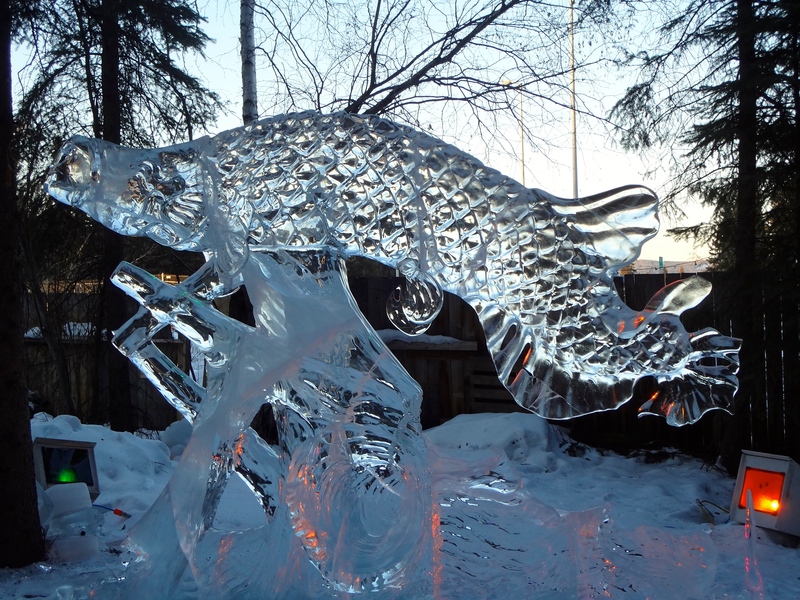 This is carved from ice. Wow! 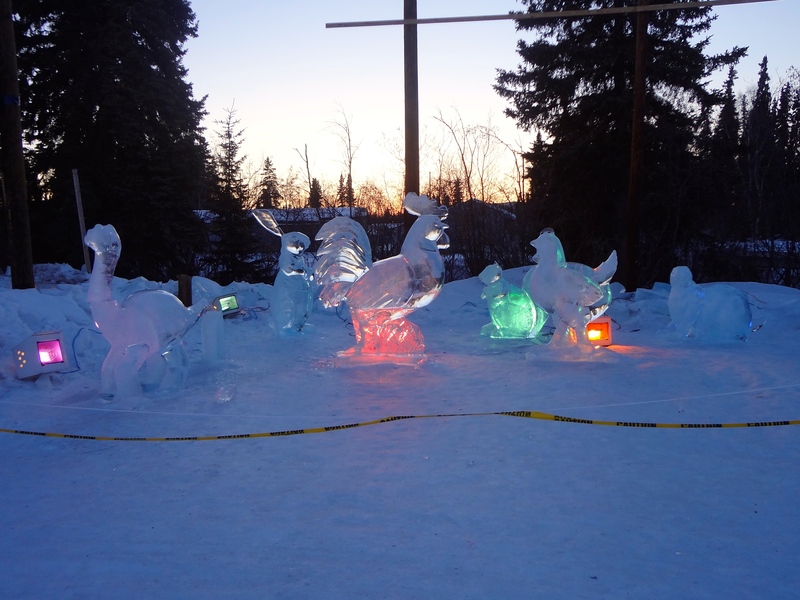 This are carved from ice blocks from a pond in Fairbanks. The ice is so clear! 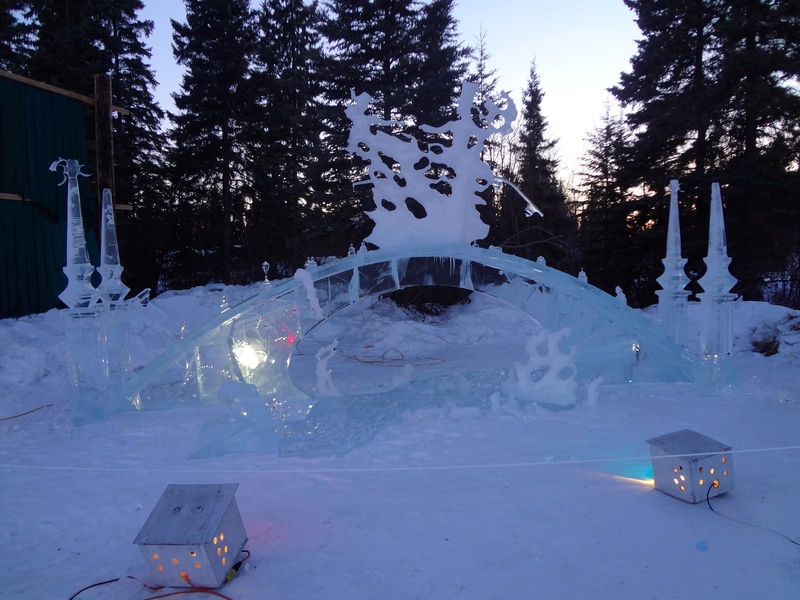 The first stage of ice carving is done with a chain saw. The final stages with small hand tools, some power tools, for the perfect final touches. Perfect details and great colors from the lights. 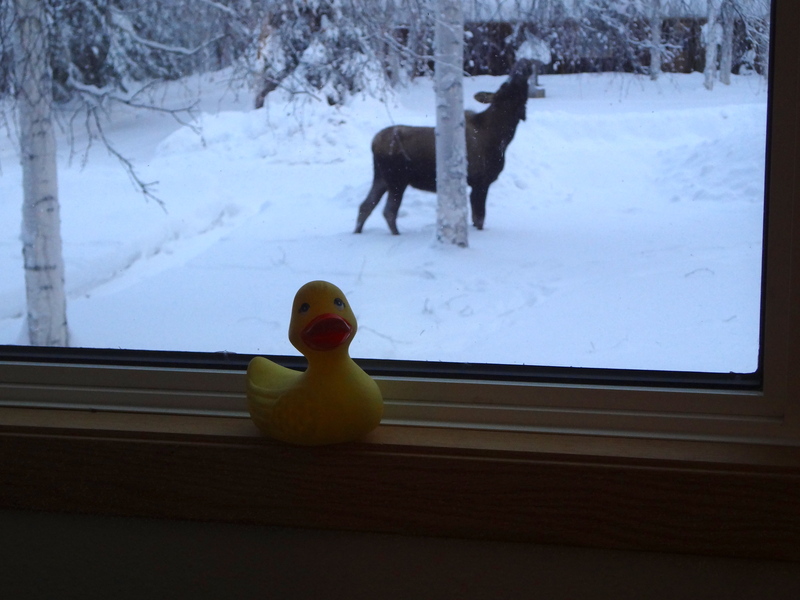 Last time we saw photos of Eider, my Alaska duck cousin and my human cousin at Chatanika Lodge in Alaska. 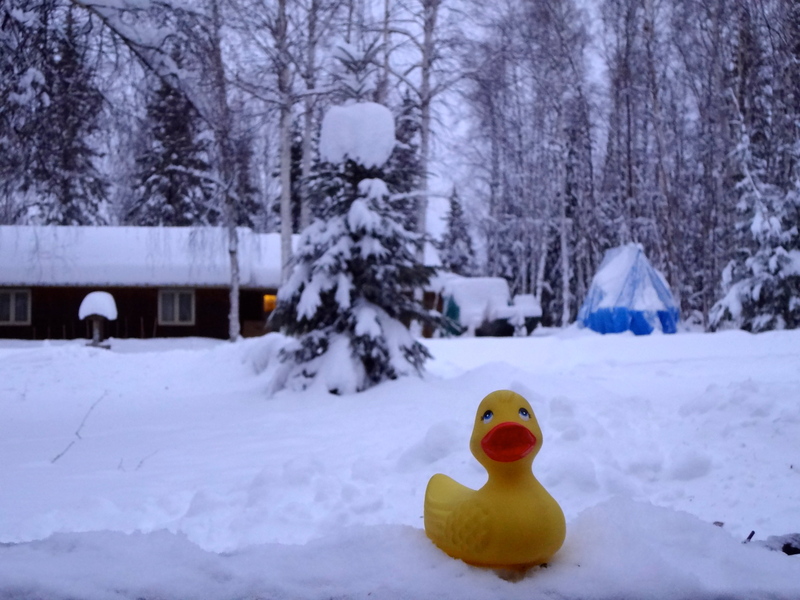 Today we have photos of Eider at home in North Pole, Alaska. I think there is a gas grill under there. Eider, that is quite a snow hat on the tree behind you. 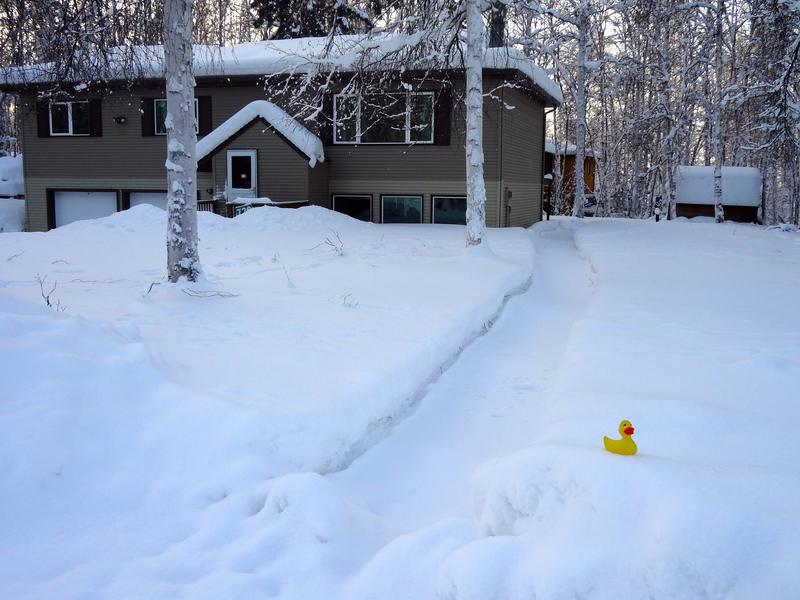 Eider’s dad shoveled snow so the people could deliver propane-heating oil to their house. 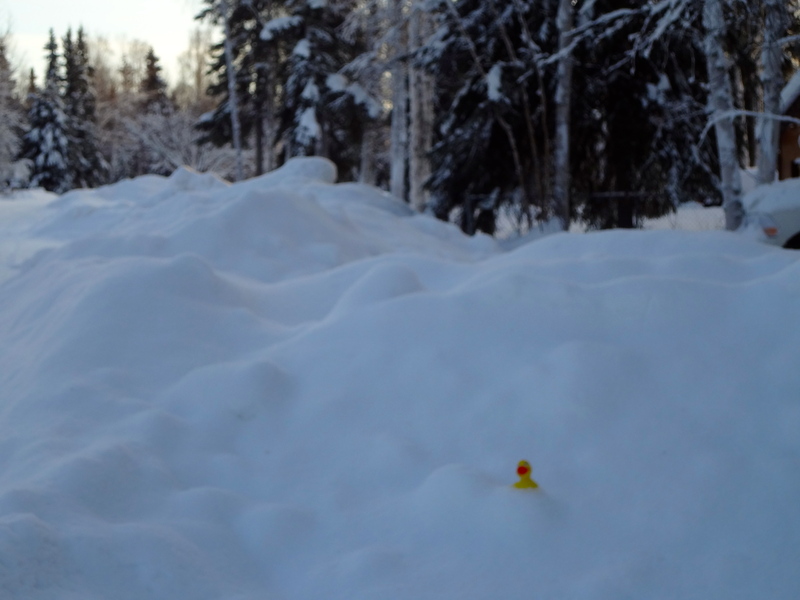 Eider is sitting on a snow bank. Cold duck feathers!! Somebody or something is looking in the window at Eider. Wow! 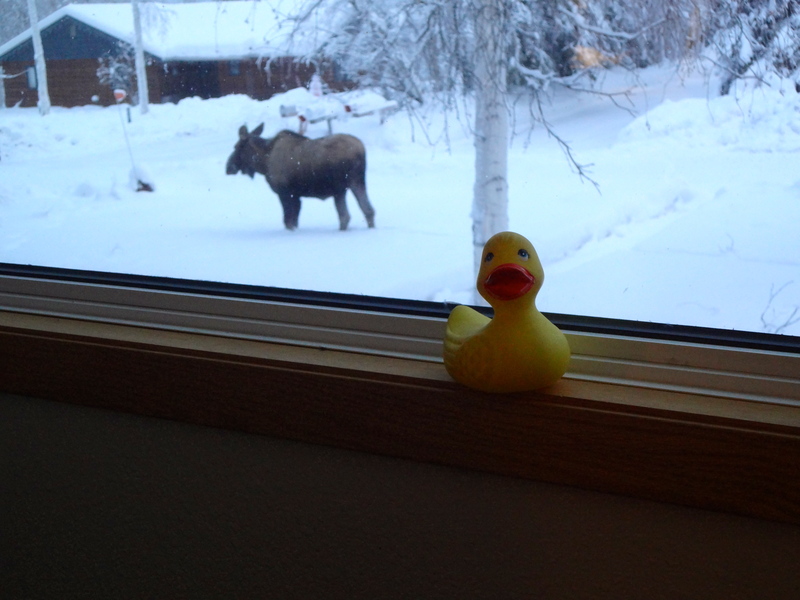 Eider has a moose in the back yard. 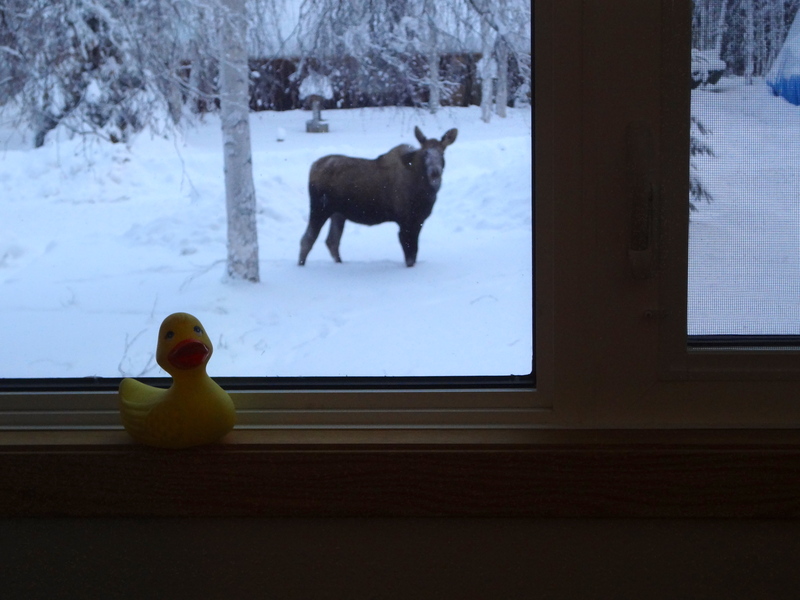 Now the moose is enjoying a snack in Eider’s yard. 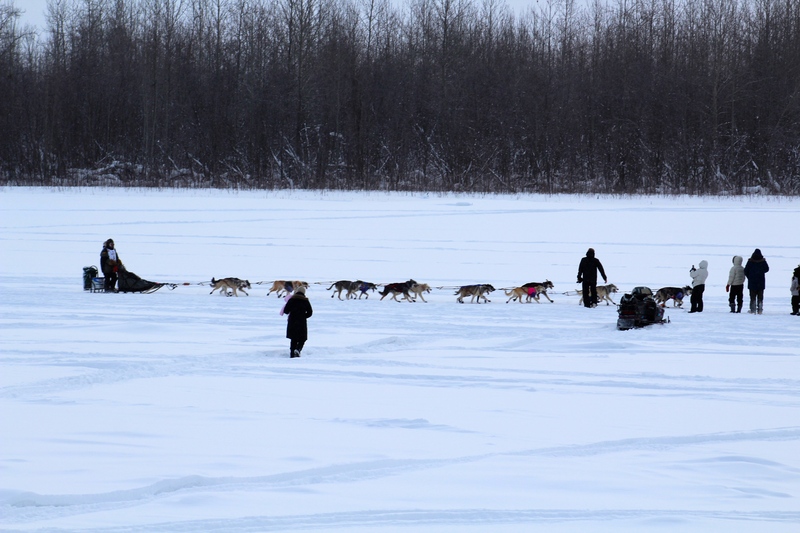 In Alaska there are many dog racing teams. 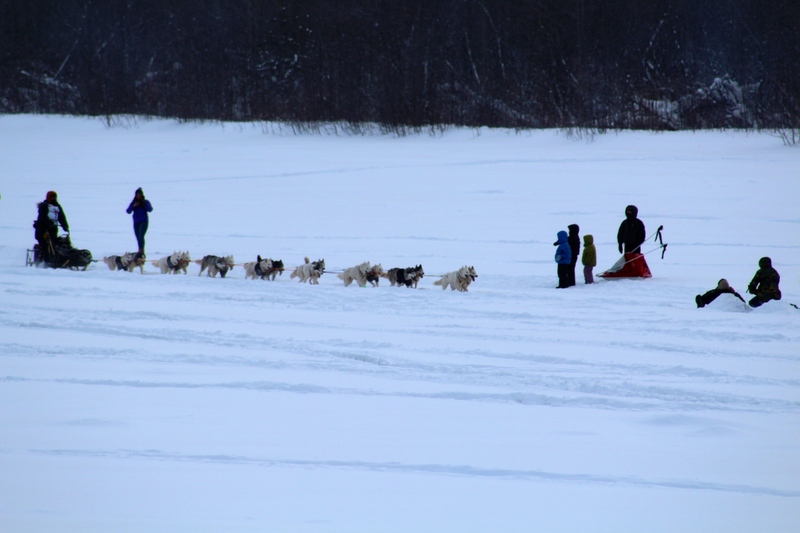 Many people have heard about the Iditarod dog sled race. 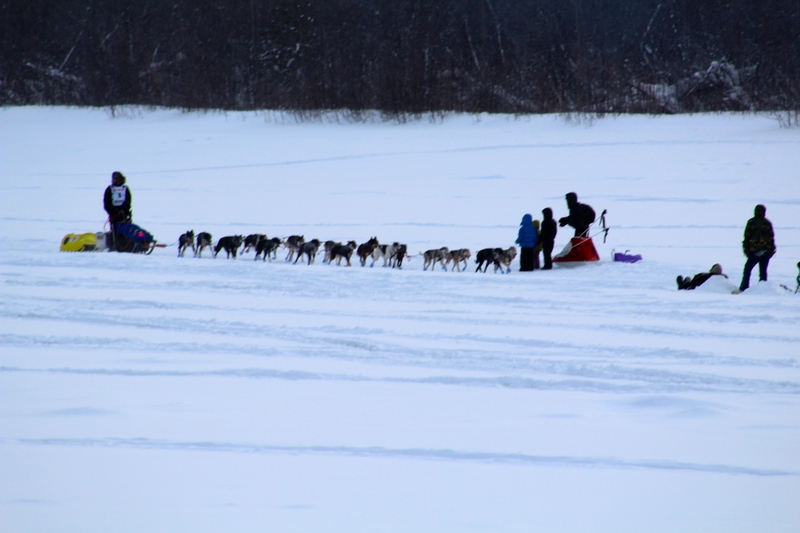 There is a second famous dog race. 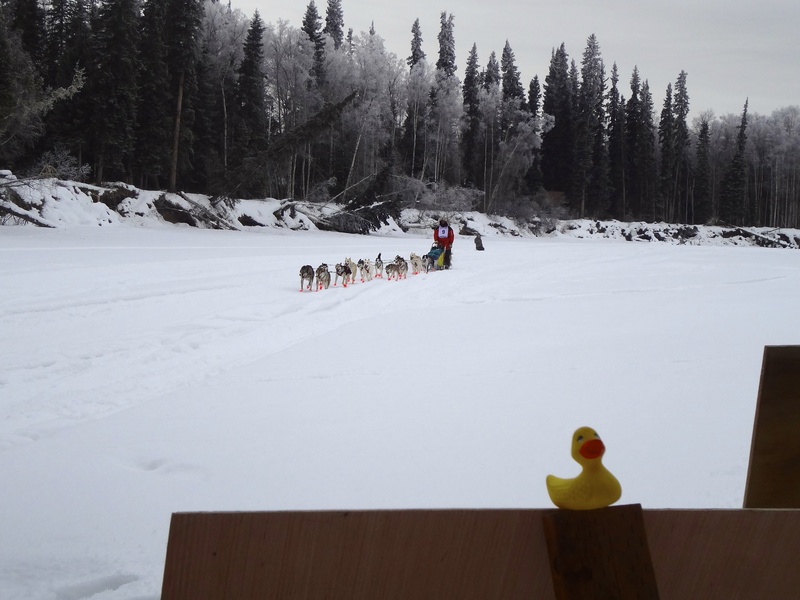 Eider and dad went to the beginning of the Quest dog race. They sent these pictures to me and I want to share them with you. The dogs wear boots to protect their feet. The orange boots are easy to see. 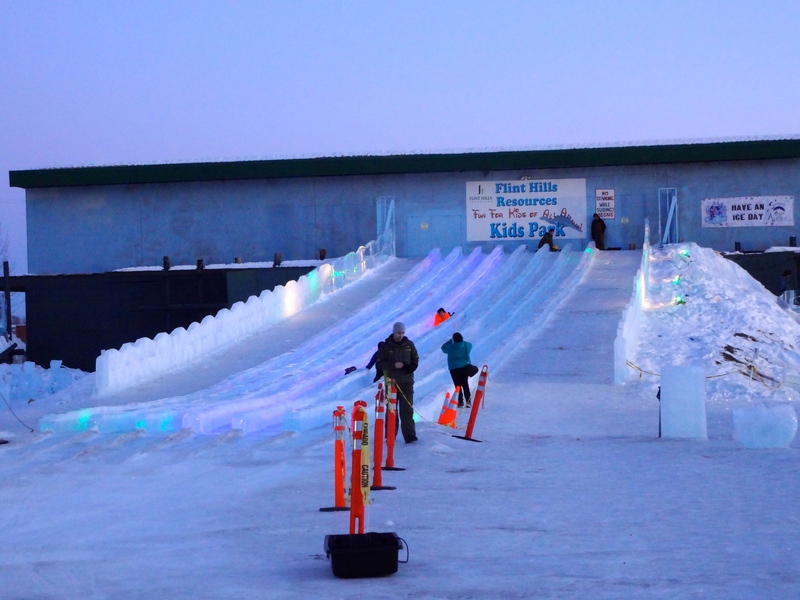 This race began in Fairbanks, Alaska and ended in Whitehorse. 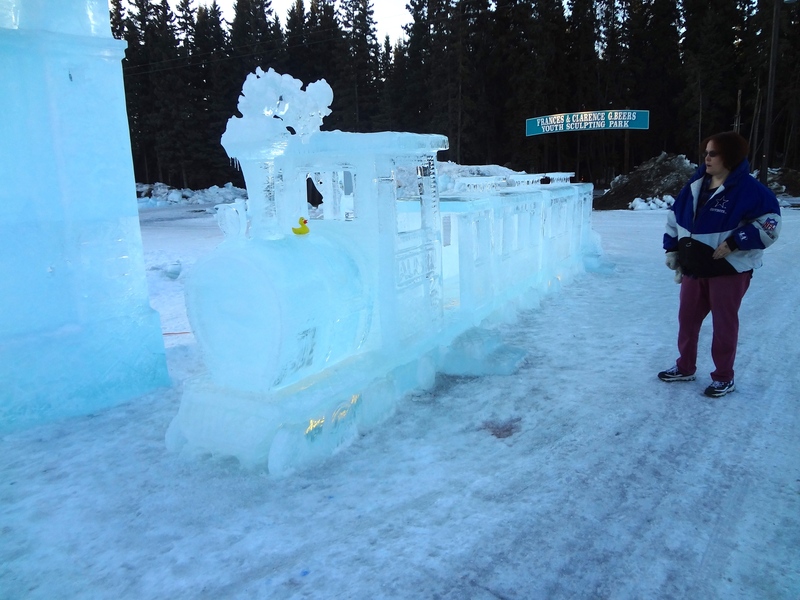 Whitehorse is in the Yukon Territory of Canada. 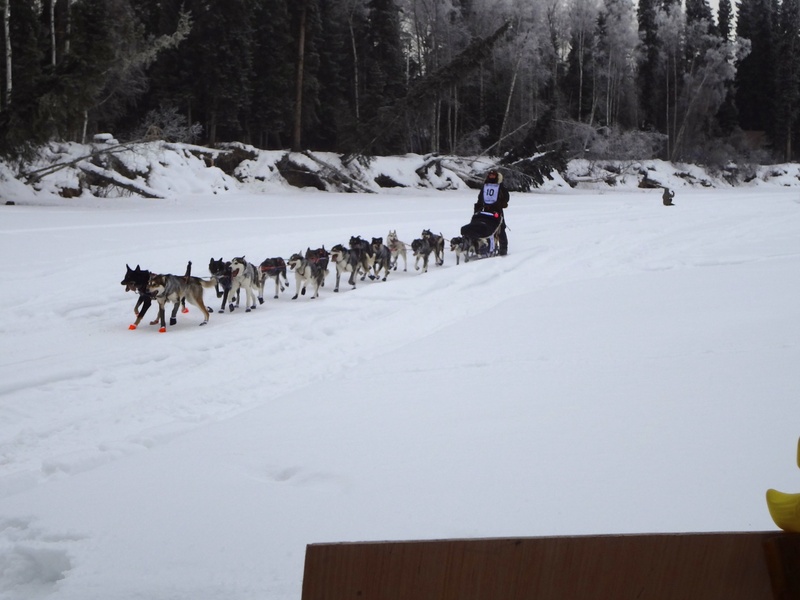 This is a 1,000 mile international sled dog race. 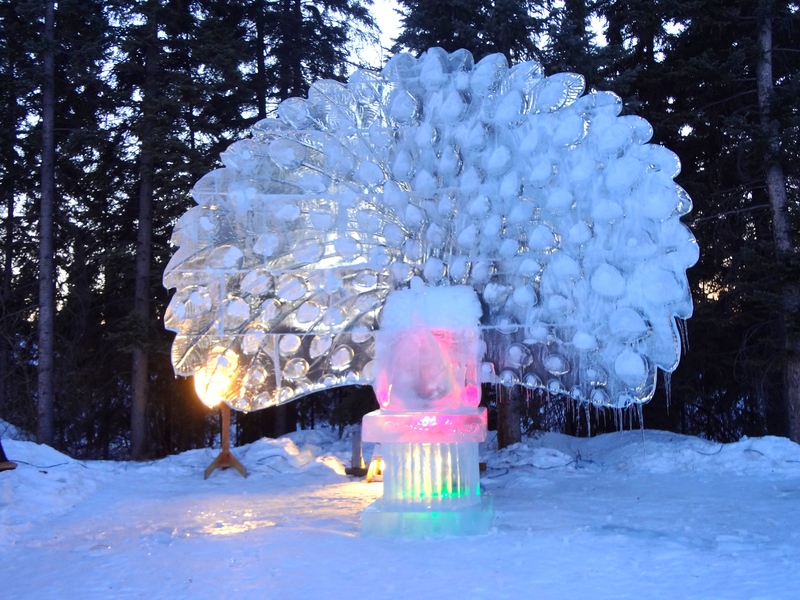 Next year the race will begin in Whitehorse and end in Fairbanks. We love getting pictures from Eider. 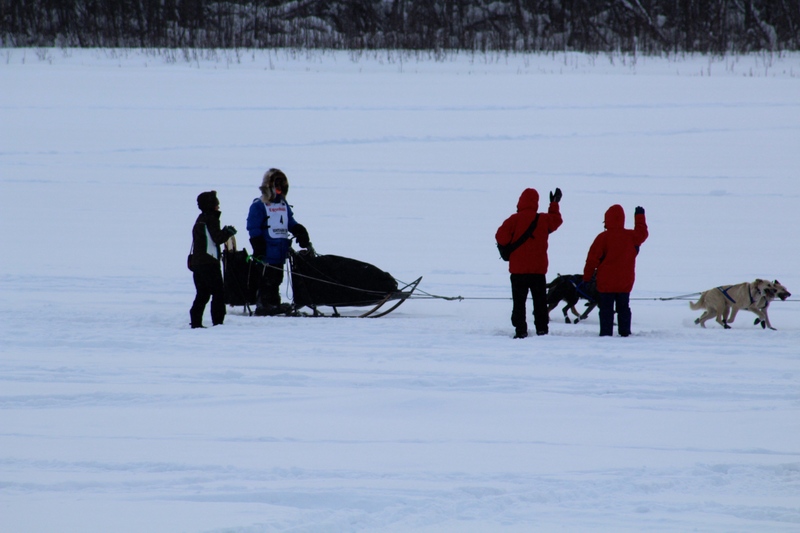 Many of the activities in Eider’s life and in Alaska are very different from our life and interesting to us. Can we have a moose? Hi. Zeb the Duck here and I am so surprised and embarrassed. You all know my Alaska uncle and my Alaska cousin. Today I got a letter and pictures from them and I learned my Alaska cousin has a name. I never knew that. The name is Eider and Eider is also a large sea duck that live and breeds in the Arctic. Eiders can fly at speeds up to 70 mph. I learned that from Wikipedia. 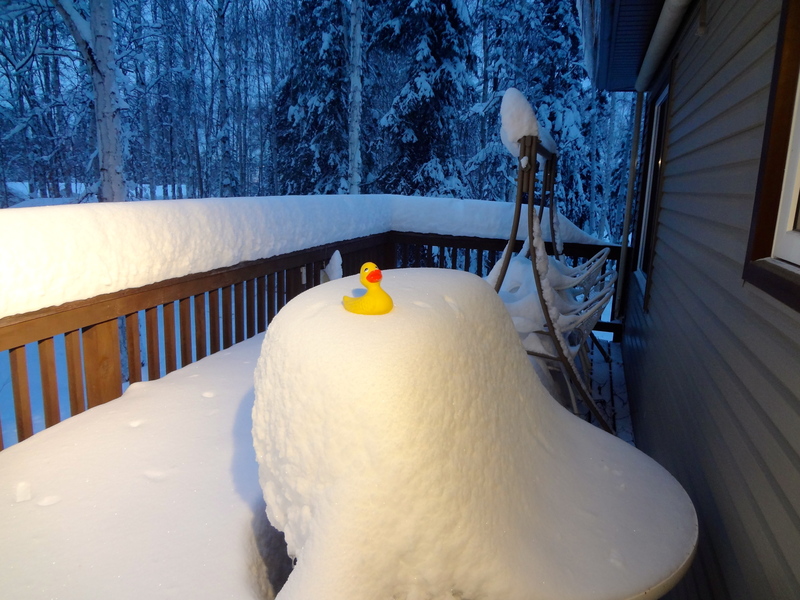 My cousin, Eider, is a true Alaskan! 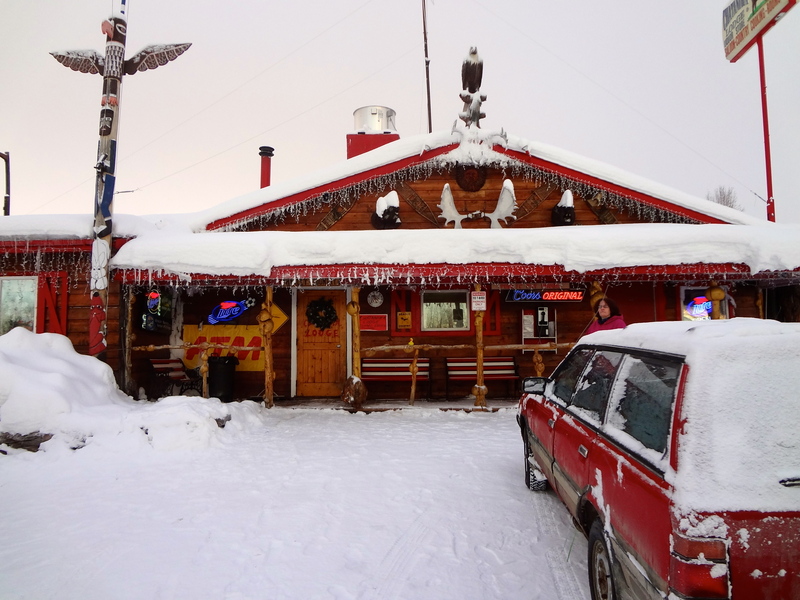 Eider and family went to Chatanika Lodge, about 28 miles from Fairbanks. These are some of the photos we received. 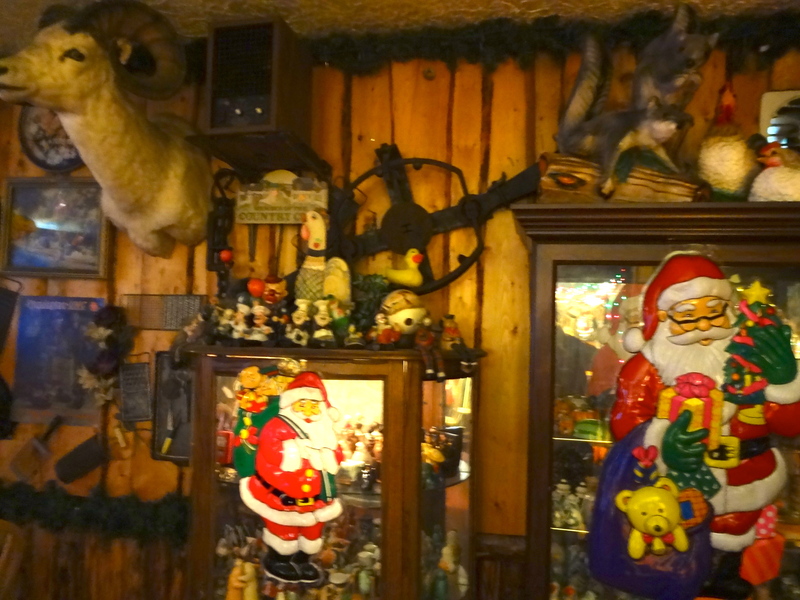 The entrance to the lodge has real moose antlers and much natural fur. The eagles are carved from wood. 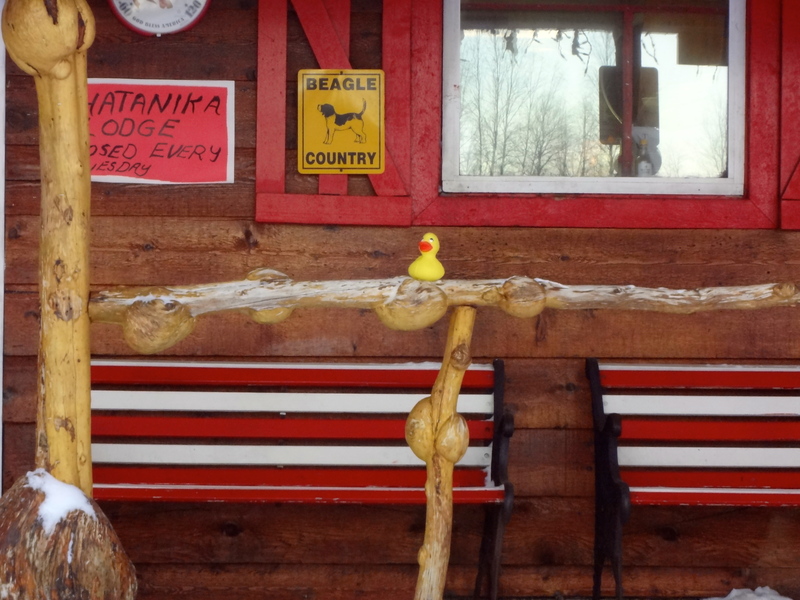 Here Eider is sitting on a rail made of spruce. The bumps on the cedar are all natural. 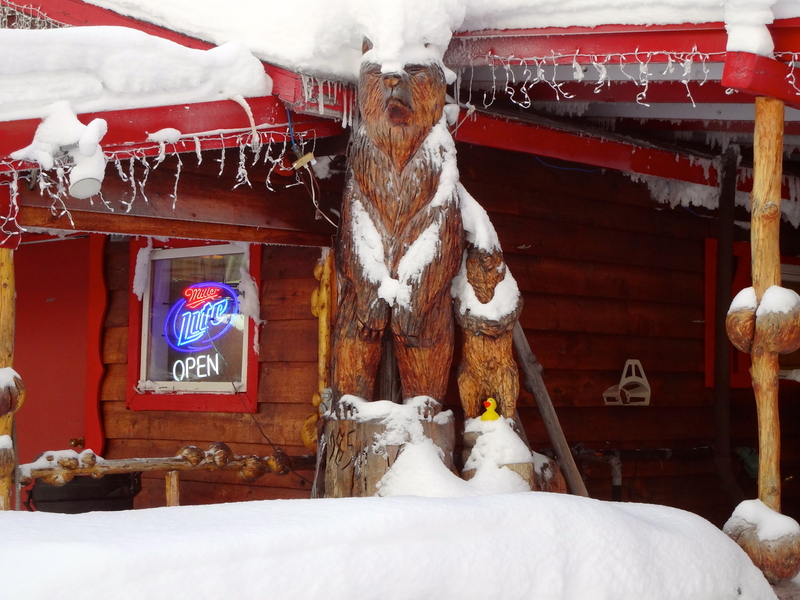 These carved wooden bears are inviting on this winter day. 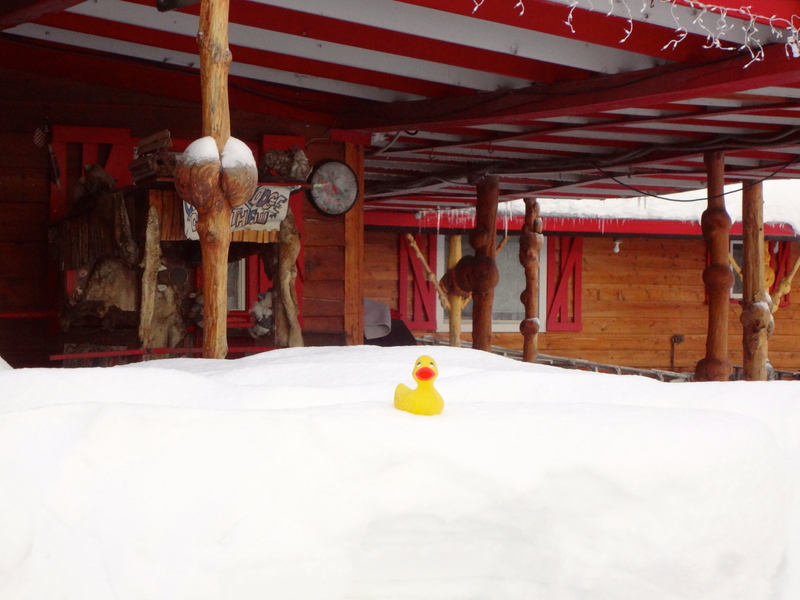 Eider is sitting on a snow bank and looks cold. 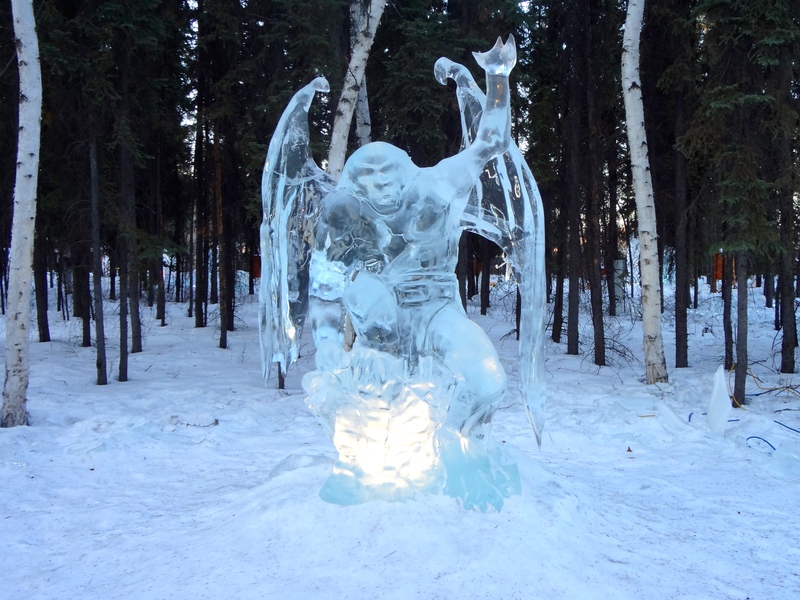 Take him inside Alaska uncle! 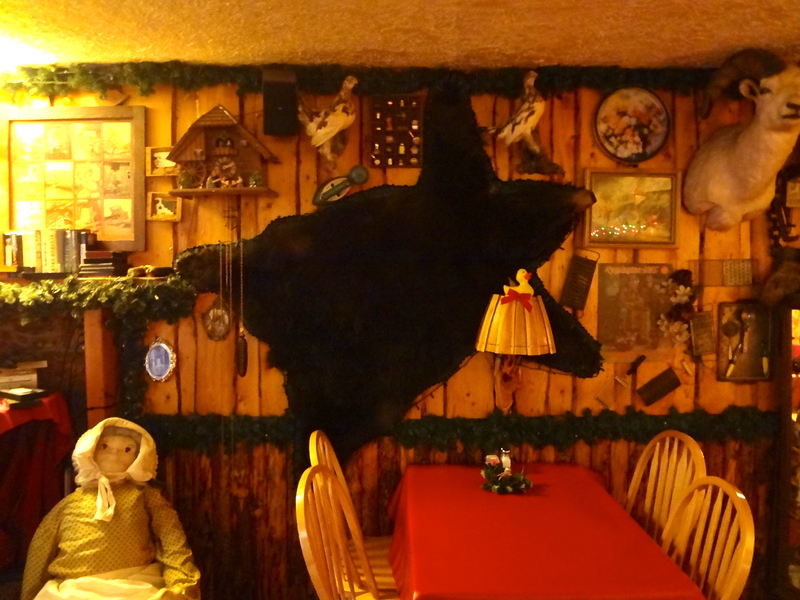 Inside the lodge is a small restaurant. 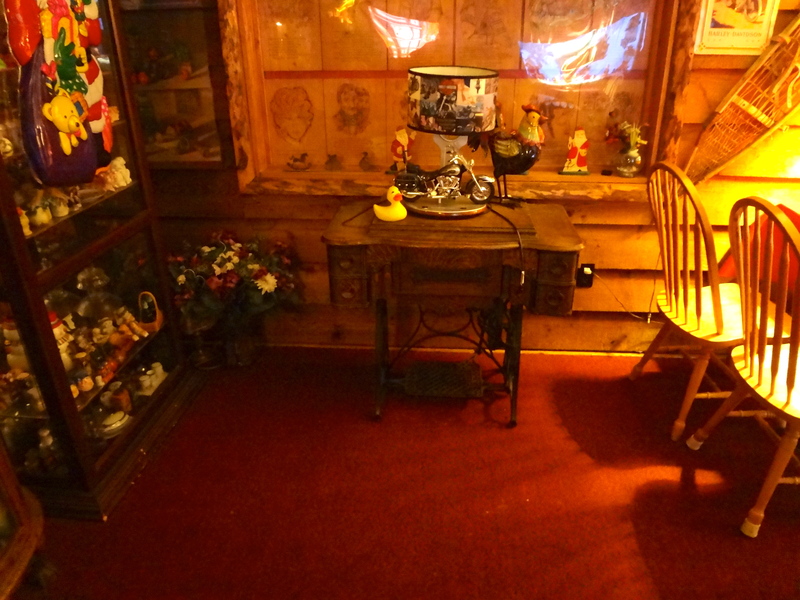 There are a lot of old Alaskan art and artifacts. 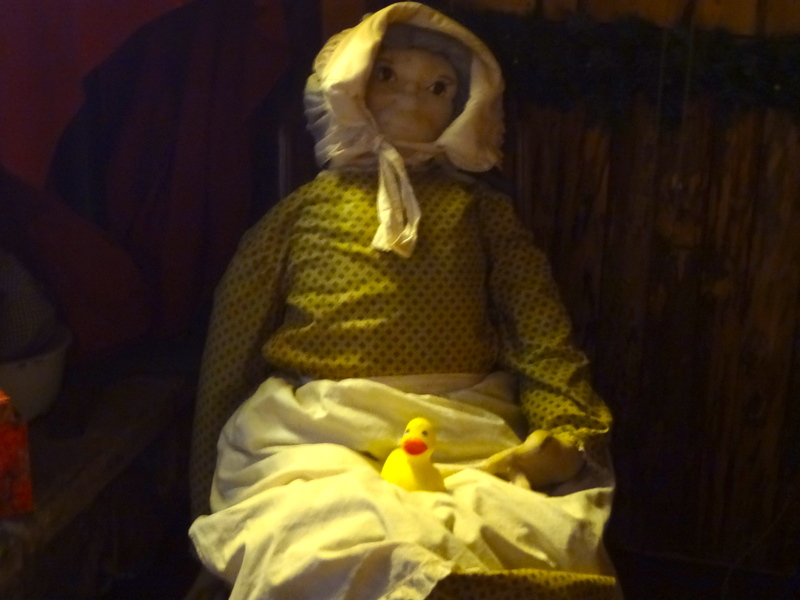 Here is Eider on a doll. Eider is sitting on old sewing machine by a Harley Davidson motorcycle lamp. 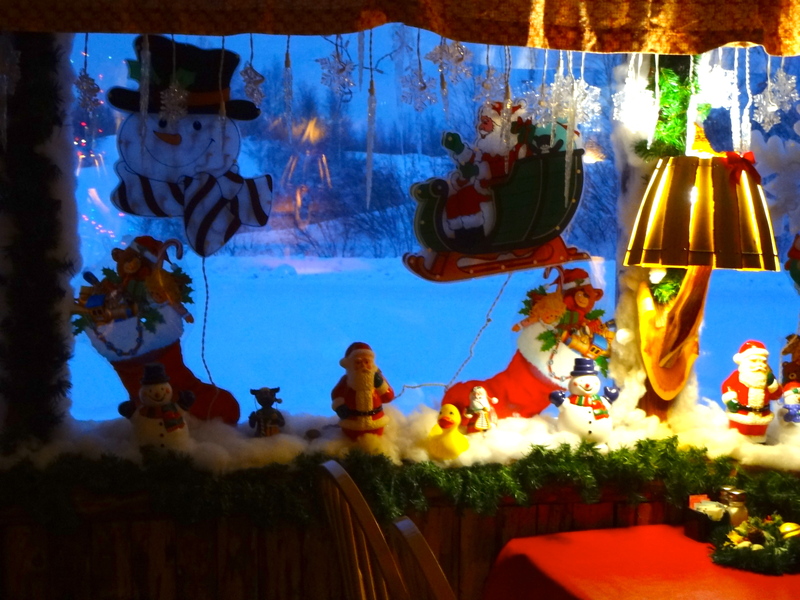 They visited Chatanika Lodge during Christmas, so we can see some decorations. 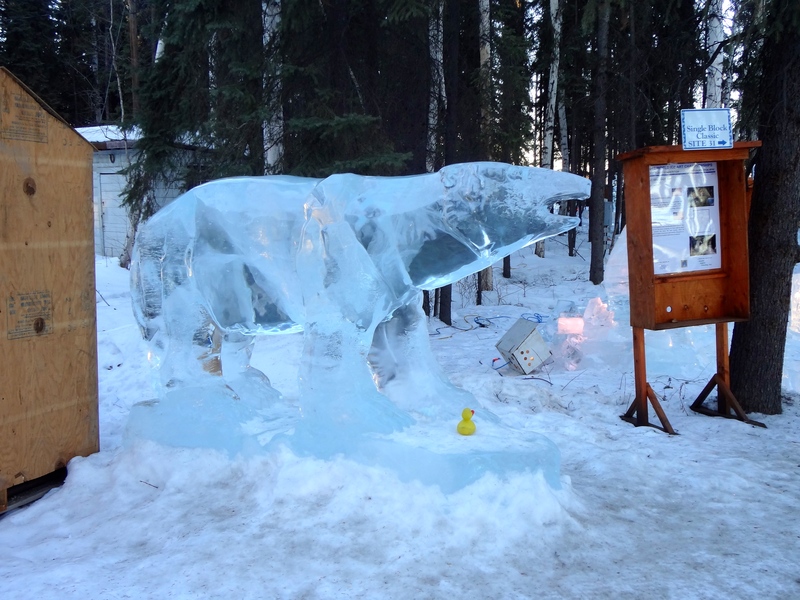 This time Eider is sitting on a bear trap. Eider. You are on a bear trap! Be careful cousin! 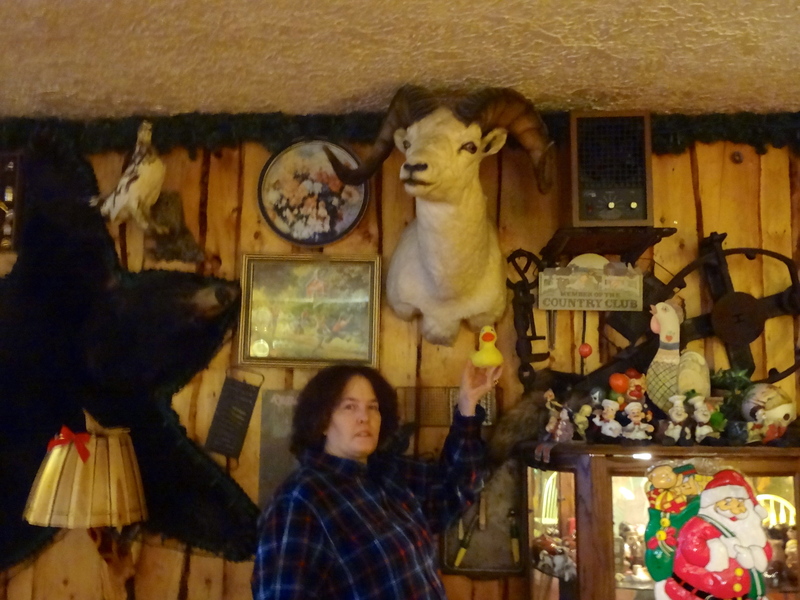 This is my cousin Cindy holding Eider by a dall sheep. Dall sheep are known for their curled horns. The horns grow in the spring and summer and then in fall and winter the growth slows and stops. The growth pattern forms rings, called annuli, and the age of the dall sheep is determined from the horns. 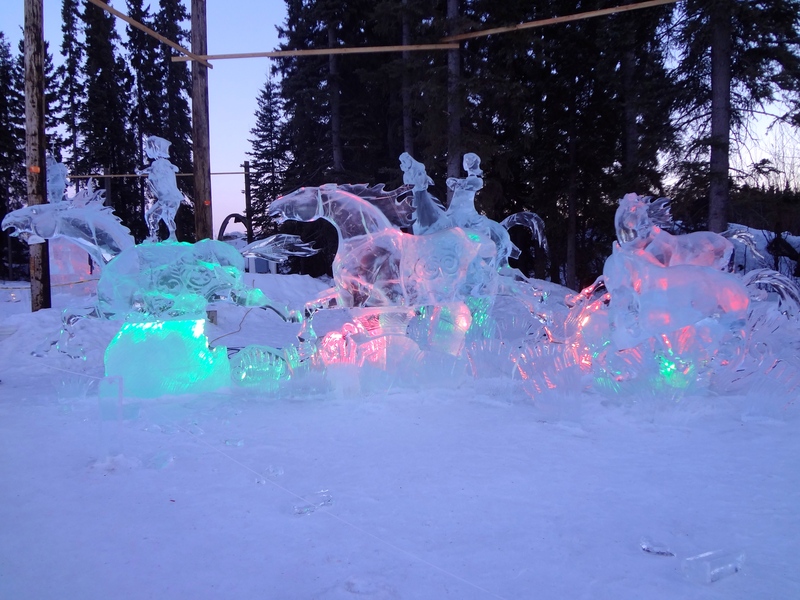 In March Chatanika Lodge holds Chatanika Days festival. One of the events is outhouse races. Teams build outhouses, a person must be in outhouse and the teams race down a course. 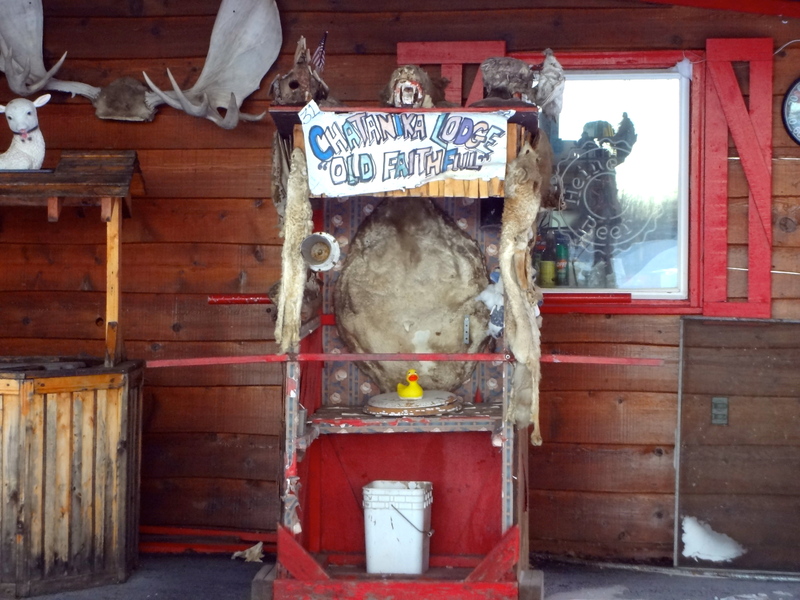 This is the original outhouse entered by the lodge for the outhouse races. This looks like a great place. To see more visit www.chatanikalodgeak.com Thanks for sending pictures Eider.